With the emergence of the report into the commission to inquire into child abuse, society is plunged into the shock and horror of its penal system. The stories of the childhoods of the individual witnesses scream out for our acknowledgement and ownership. The padded cell and its use within the Irish confinement system doesn’t feature that much in the recent Ryan report, but it was later used to contain many of those who emerged from the industrial and reform schools. Anyone who was so overwhelmed by their traumatic experience or who was deemed uncontrollable or who the system wished to isolate further was muffed (physically restrained) and isolated in padded cells. In recent times, the former minister for justice, Michael Mc Dowell ordered the end of the arbitrary use of the padded cell and replaced it with what are now known as observation units. 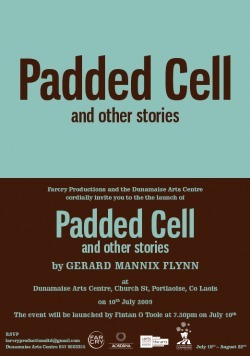 “Padded Cell and Other Stories” places the padded cell at the centre of the story that emerged from the Residential institutions which are now the subject of much debate in our society. The installation is positioned in the former Gaol, and now courthouse and Arts Centre in Portlaoise Town. A place synonymous with the Irish Prison system.